Saturdays are usually my days for staying inside and playing video games, as opposed to all the other days where I might step outside now and then just to make sure the world is still there. Not this past Saturday, November 8th, however. No, I spent the better part of the day down the street at the internet gaming cafe Comeputer Arena, celebrating the coming out of local developer Hi-Rez Studios' action MMO Global Agenda at their MISSION: Pwning for the Cure event, held in benefit of the Leukemia and Lymphoma Society. It was a day of gaming, good times, and charity, filled with multiplayer sessions of Global Agenda, a charity raffle that I actually won something from, and a guest spot for me on AllGames.com's Bobby Blackwolf Show during which I embarrassed just about everyone alive. Hit the jump for details on the event.The Location The event took place at Computer Arena, a lovely little gaming cafe located off of Alpharetta Highway in Roswell Georgia, that I didn't technically know existed. It's literally right down the street from me, but there's a giant Hi-Fi Buys sign obscuring their sign, a problem that is soon to be solved by the economy. Computer Arena not only features multiple computer stations, a slew of Xbox 360 stations, beer, snacks, and soda, but it also features a learning center that holds classes, and more recently CC Gaming, a vintage game shop in the back that buys and sells titles from every era. It's definitely a place I shall be spending more time at in the future. The Participants It was hard to tell who all was with Hi-Rez Studios and who wasn't, seeing as all the employees of Computer Arena, CC Gaming, and Hi-Rez were all wearing the company's logo on their t-shirts. Along with the staff of the establishment and the developers, appearance were also made by representatives of the Georgia chapter of the Entertainment Consumer's Association (ECA) and Asante Bradford from Georgia's Department of Economic Development's Film, Music and Digital Entertainment Office. You know, the guys who give tax breaks for developers willing to put peaches in their games. Yes, Global Agenda will have a Georgia peach splash screen. It's a further 10% tax break on top of Georgia's already generous 20%, so I can't say I blame them. The Game Global Agenda is coming along quite nicely. Levels and assets had changed from when I last played the title, giving the MMO a much more polished feel to it. Still no word on the more persistent world elements of their persistent world game, but the event wasn't about that. It was once again all about combat. There was a Noobville area where new players could create accounts and learn the basics, but the real action was in the PVP area, where players could take on each other in multiplayer rounds, culminating in a best of the best competition towards the end of the day that I really had no reason to stay for, seeing as I am nowhere near the best, much less the best of them. In fact, I had the misfortune to sit next to one of the game's best players during my PVP session, who was on the opposing team. I had found a lovely spot to snipe from and was minding my own business when bam, there he is, taking me out and keeping me separated. I swear he was a dirty screen-peeker. The Broadcast Bobby Blackwolf and I have been meaning to get together on a broadcast for a good year now at least, but never had the chance to. Perhaps we were better off. What was meant to be a quick stop by wound up being several quick stop bys as I tried to help Bobby fill the downtime between interviews with representatives from the ECA, Hi-Rez, and the Leukemia and Lymphoma Society. You can find the broadcast over at AllGames.com. If I actually offended anyone, it wasn't me. I blame Pandalicious. The Spoils Towards the end of the day there was a raffle held, for which I bought several tickets at $5 a pop, thinking of nothing more than supporting a good cause. Certainly I wasn't thinking of the boxed NES and N64 systems they had in the auction, courtesy of CC Gaming. No, my intentions were merely philanthropic. I did manage to win something, however. I am now the proud owner of a 4MB Creative Zen MP3 player, which they gave out immediately following the iPod Nano as sort of a consolation prize. Thank you, charity raffle. You just made Christmas shopping for my nephew so very much easier. The Results Not only was the event highly enjoyable, it was also highly successful. All in all nearly 300 folks passed through the doors during the event, raising a grand total of more than $4,700 for the Leukemia & Lymphoma Society. Not only that, but it also helped raise awareness of the game development industry as it stands in Georgia, which is growing, but far too slowly for my tastes. On a more personal level, the event made me aware of the fact that I should never, ever do live radio, and that there's a really cool retro gaming store right down the street from my house which I will from here on out be loitering at on a regular basis. Thanks go out to the folks at Hi-Rez for putting on an excellent event, as well as the guys at the Computer Arena, even if the owner did think I was 45 years old. Special thanks go out to Hi-Rez's incredibly persistent Michal Adam (above left) for making sure I didn't sleep through the whole thing and providing me these lovely photos from the event. GEORGIA VIDEO GAMING COMMUNITY TO CANCER: "PWNED" Charity event features sneak preview of Hi-Rez Studios' action online game Global Agenda™ ATLANTA, Georgia– November 11, 2008 - Hi-Rez Studios, an independent developer of online games, previewed its action massively multiplayer online game Global Agenda to a crowd of nearly 300 attendees at the Computer Arena in Roswell, GA on Saturday, November 8th. Dubbed "MISSION: Pwning for a Cure", the all-day community-oriented event raised over $4,700 for the Leukemia & Lymphoma Society. The event is part of a multi- year Hi-Rez Studios fund raising campaign toward blood cancer research. 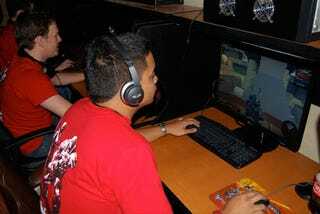 The free event allowed game enthusiasts an early preview of the game Global Agenda, currently in closed alpha testing. Attendees created agent characters within the virtual world of Global Agenda, experienced solo and cooperative training missions, and engaged in immersive, objective based, multi-player combat. In support of the budding video game industry in Georgia, the event also included art and animation training seminars conducted by the Hi-Rez Studios development team. The well-attended, interactive sessions demonstrated the sophistication of the technology, tools, and talent involved in the development of a modern computer game. "One of the downsides of covering the gaming industry from Georgia is that one often has to travel across the country to do the job", says Bobby 'Backwolf' Tamburrino, host of the Bobby Blackwolf Show on All Games Radio. "But that's changing. The ability to literally go down the street from my home to attend Pwning For A Cure was a welcome change. Several listeners to our live coverage mentioned that they wished an event like this was in their neck of the wood. That bodes very well for the future of gaming in Georgia" About Hi-Rez Studios Hi-Rez Studios, Inc. was established in 2005 to create exceptional online interactive entertainment and is located just outside of Atlanta, Georgia. For more information, visit www.hirezstudios.com.